Food Journaling is one of the most important daily habits you must keep to help you lose weight and change your eating habits. It helps keep you accountable for what you eat. A cookie here, a piece of chocolate there, add up fast. When you have to write it all down, you may decide you don’t want to waste extra points, and you may opt for a healthy low point snack instead. If you are REALLY serious about weight loss, you need to start journaling. And you must be honest and write everything down. If you journal everything you eat everyday, you will start to see where you are making mistakes, where you can cut down on points, and how you can alter your meals. 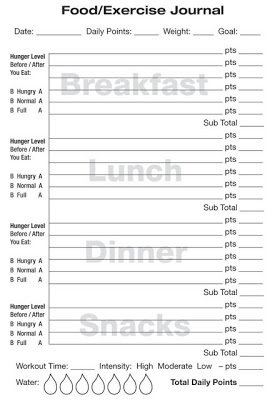 After the first week it becomes very easy because we often have a routine, so most meals, you will have the points memorized. I like to keep my old journals so I can go back and reference the points if I am eating the same meal. It is recommended that you drink 6 cups of water a day. Writing it down also helps you to remember to drink, which many of us often forget to do. Each time I drink a cup, I cross it off my list. Another great idea is to write down your hunger level before and after you eat. This way you can realize when you are eating because you are hungry or eating out of boredom. I have attached a sample of the journal I made for myself. I keep mine by my computer at work all day. I try to keep my points low all day so I can have a nice dinner. I also go to the gym, so I keep that into account in my journal. If I know I am going to eat more than my daily points allow, I will be more determined to work out and burn those points without feeling guilty for eating. Feel free to copy this food journal I have created and print several copies and start using it today. Click on the image to enlarge and print. I’ve been successfully using your recipes for a year now! Love Love Love!!! I don’t even mention that the chicken parm recipe is a “skinny” version until after the meal is over! Can you provide information on where to pick up a food journal? I use my Fit Pal app to track meals and macros but would start tracking the recipes as well. Thanks for inspiring me to cook healthy and still be able to keep it delish! I heard about your website from a Weight Watchers counselor. As soon as I got home I jumped on the computer. Your blog far exceeded my expectations and I'm telling everyone about it. It's the first place I go when planning meals. Today I'll be recommending it to a friend who has plateaued and is having trouble loosing weight. Your recipes are delicious and I know your weight loss tips are going to help my friend. Thank you so much. Please keep it going and let us know when your cookbook is coming out!!! RECIPES AND OTHER HELPFUL INFORMATION… I HAVE LOST 25 POUNDS IN 22 WEEKS!! WW IS VERY DO-ABLE!! MUCH EASIER THAN MAKING EXCUSES FOR 10 YEARS!!! I'm glad I can make a difference. Good luck! I have heard of water intoxication from people drinking too much water. I found an article that may be helpful. It was educational for me as well. But 6 – 8 cups of water will not hurt you. You would need to consume a lot more at one time. Hope this article helps. Hi there, great information from you all the time. There is something that I am quite puzzled which is the water intake. There have been quite a few reports that people become blind or die because of drinking too much water. Some reports are saying that different people have their own limit of consuming certain amount of water. For example, I do not drink much water no matter how I force myself. Therefore, I assume that I cannot consume a lot of water. I wonder if you have some proven evidence on the consumption of water per day. I tried googling but most of the articles are saying that ‘it is recommended’ and then nothing else. By the way, your recipes make me drooling. I think your site is awesome! I will peek in now and then to catch a great, low cal recipe or two. I’m going to tell a couple friends about your site, too.